Hi Friends: Today I'm sharing a card using the new Italian Greyhound stamp set from JessicaLynnOriginal stamps. This stamp set is being released on May 6th, and if you go to the official JessicaLynnOriginal blog and leave a comment on the Greyhound post that day, you'll be entered for a chance to win a $15 gift certificate in Jessica's store. Visit all of my design teammates and see what else they've done with this cute stamp set. Thanks for stopping by today! I hope you take time to do what makes you happy! 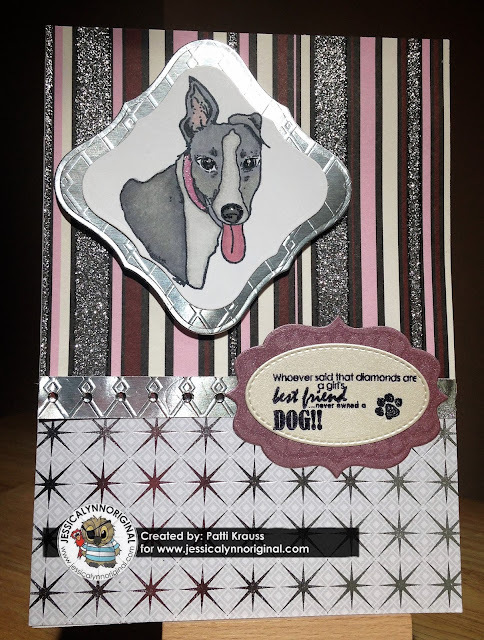 Stamp image onto smooth white cardstock and color with Spectrum Noir markers, then add Glitter Brush pen to collar and Glossy Accents to nose and eyes. Once dry, cut image with Labels die, so that it forms a diamond shape. Cut the next larger size label from embossed silver foil paper and layer under image. Cut panels to fit A7 card base from All Dressed Up and Touch of Foil paper pads. Cut 1" strip of embossed silver foil paper to cover seam. Stamp sentiment and paw print onto pearl shimmer cardstock with Jet Black ink and heat emboss with clear gloss embossing powder, then cut with stitched oval die. Stamp diamond label stamp onto pink shimmer paper with Versamark ink, heat emboss with clear gloss embossing powder, then cut with Fancy 4 Labels die. Layer sentiment oval onto diamond label and attach as shown. Add image with foam squares and finish with a strip of gems along the silver strip.